Don't worry; unlike those pop quizzes teachers used to give you in high school, there's no need to study for our fun and interactive personality quizzes. Simply pick a subject (or two! or three!) that interests you, answer a few short questions and learn something about yourself that you may have not known before. What are you waiting for? Get started now. 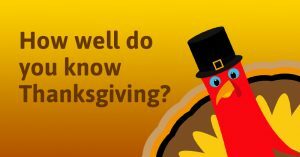 How much do you know about Thanksgiving? Put your knowledge to the test! Here’s a mash-up of our favorite Thanksgiving trivia. Where was the first Thanksgiving gathering in 1621? About 90 Native Americans attended the first Thanksgiving. Which tribe were they from? How many of the 50 Pilgrims who attended were women? What did the Wampanoag bring to the feast? Who played in the first Thanksgiving football game of 1870? Which department store hosted the first Thanksgiving parade in 1920? Which U.S. President pardoned the first turkey? For how many days can you safely keep turkey leftovers? 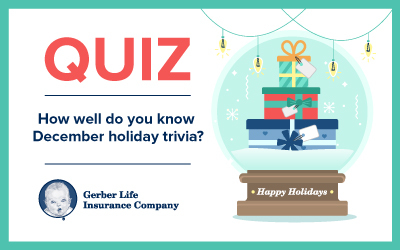 Quiz: How well do you know December holiday trivia? You started planning and decorating for the December holidays way ahead of time. Your family remarks that you’ve been listening to holiday songs every evening for two weeks straight. Your enthusiasm for the season is apparent to everyone who knows you – and even to people who don’t. However, how much do you know of the history and meaning behind the holidays? Test your knowledge by answering these trivia questions. 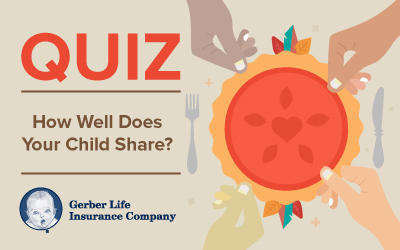 How Well Does Your Child Share? Your children are in the living room playing when you hear one exclaim, “That’s mine!” – followed by sounds of scuffling and then crying. It can be frustrating to continuously have to tell your children to share with one another, as well as with other children. But it’s worth the effort. Sharing is a critical social skill that can help your child build relationships later in life. Being a role model and showing your child how to share is the best way for them to learn this important skill. 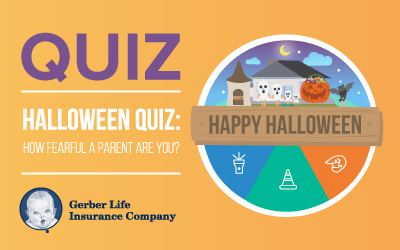 Halloween Quiz: How Fearful a Parent Are You? If you’re a first-time parent, you probably worry about your child. It’s only natural: You want to keep your son or daughter safe. That desire might lead you to go a little overboard at times, from repeatedly checking on your baby throughout the night to triple-washing his or her pacifier after it falls to the ground. It’s good to remember that your child, from an early age, takes cues from your behavior. A child whose parents struggle with anxiety is two to seven times more likely to develop an anxiety disorder themselves, notes Golda Ginsburg, a psychologist at the Johns Hopkins University School of Medicine who studies childhood anxiety. How can you get a grip on your parenting fears? Start by evaluating them.